Eager to learn more about sustainability and the wine industry? 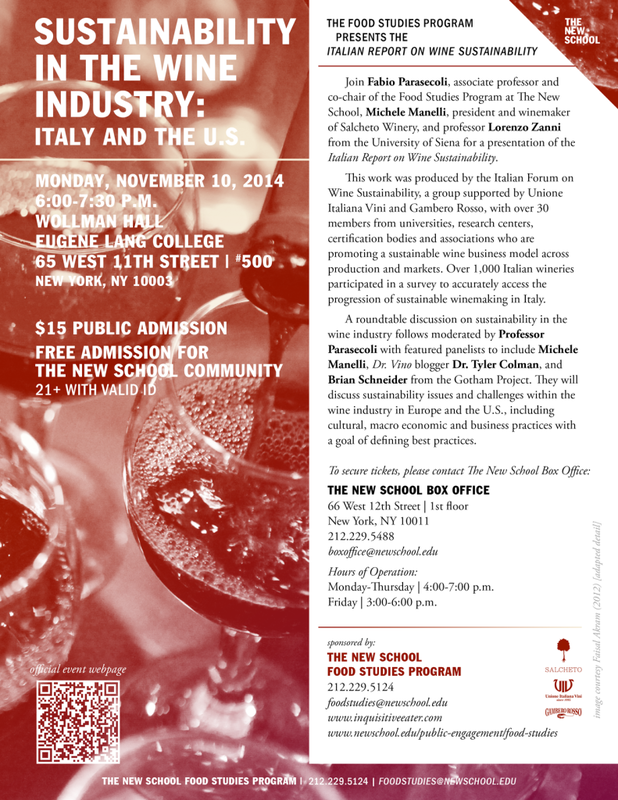 Join Fabio Parasecoli, associate professor and co-chair of the Food Studies Program at The New School, Michele Manelli, president and winemaker of Salcheto Winery and professor Lorenzo Zanni from the University of Siena for a presentation of the Italian Report on Wine Sustainability. A roundtable discussion on sustainability issues and challenges in the wine industry follows, moderated by Professor Parasecoli, with featured panelists to include Michele Manelli, Dr. Vino blogger Dr. Tyler Colman, and Brian Schneider from the Gotham Project. The discussion will be followed by a reception and tasting of four Italian wines.